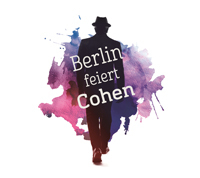 I am one of the organizers of the Berlin Concert Berlin feiert Cohen, which takes place excactly on the 21th of September in Berlins Passionskirche. On board is Misha Schoeneberg, who translated many of Cohens Songs in German. They were confirmed by Cohen himself. Actually Cohen let him re-translate the Translations to English! 17 Songs can be heard on a new German Album "POEM - Leonard Cohen in deutscher Sprache"(Sony Music). A few more will be featured in our concert. The Line-Up: Andreas Albrecht, Veronika Fischer, Nina Hagen, Joa Kuehn, Anna Loos, Manfred Maurenbrecher, Johannes Oerding, Mokkapan Pongphit, Max Prosa, Jan Preuß & die Geheime Gesellschaft, Réka, ScherbeKontraBass und Suzanna & Karsten Troyke. We hope for a magic night. If you can´t make it, but have friends in Berlin. Please share.